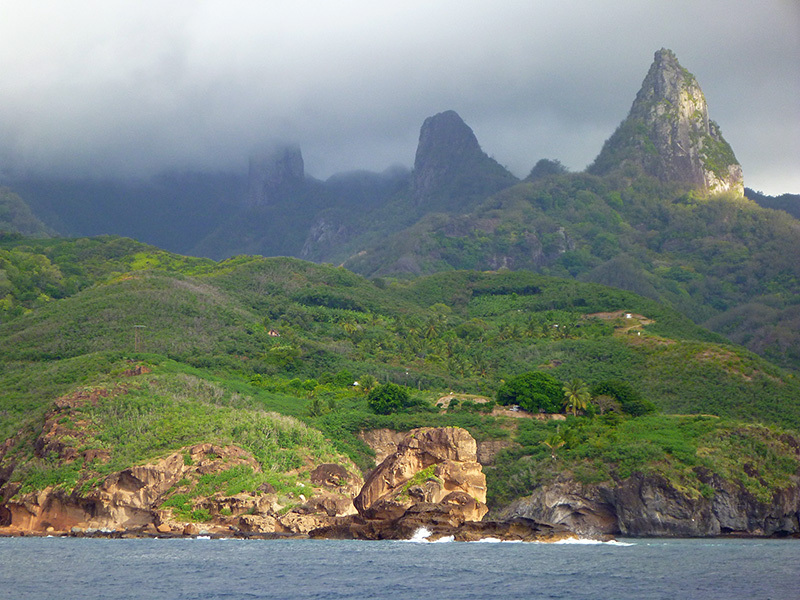 We didn’t do justice to our last island stop in the Marquesas, Ua Pou, but it was on the way to the Tuamotus so we went ahead and stopped there. 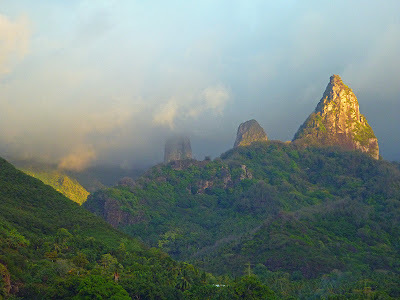 By then, we had spent too long in the Marquesas (we only have 90 days in all of French Polynesia) and our minds were turning towards the Tuamotus and a weather window for sailing there. I also had some kind of tropical bug and felt feverish, fatigued, and sometimes nauseated the entire time we were on Ua Pou. While there were several enticing villages on the east coast of the island (better accessed by vehicle due to inhospitable anchorages), we did not travel there to see them. We did visit two anchorages. 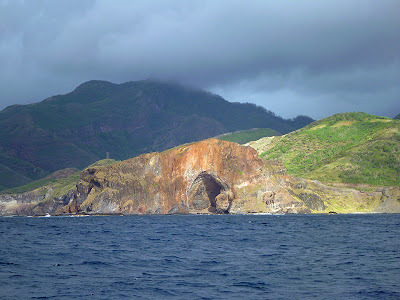 We made a day sail from Taiohae, Nuku Hiva to Hakahetau, Ua Pou. 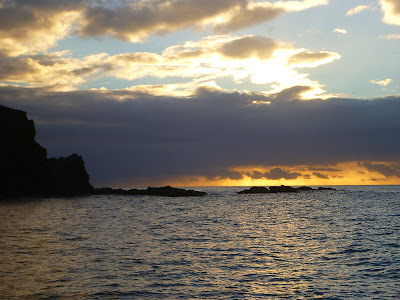 We had a late start from Taiohae, so we arrived at Hakahetau just before sunset. 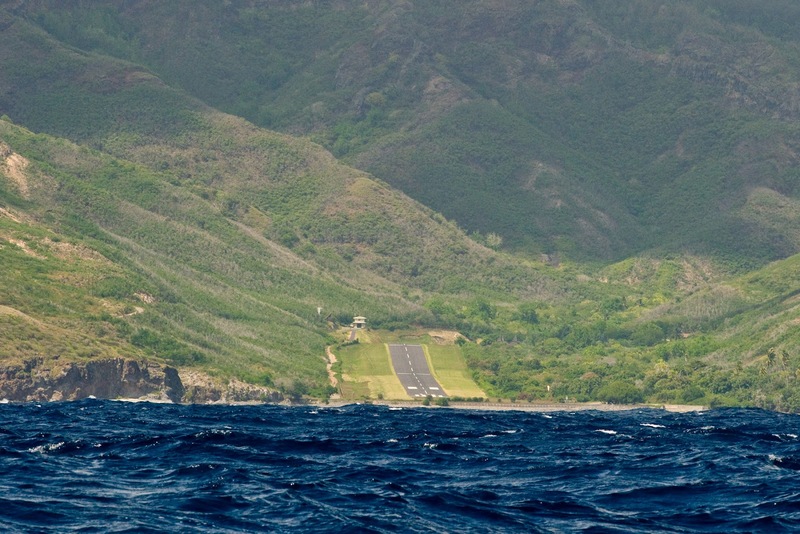 En route, we saw Ua Pou’s unique airstrip with its uphill runway. 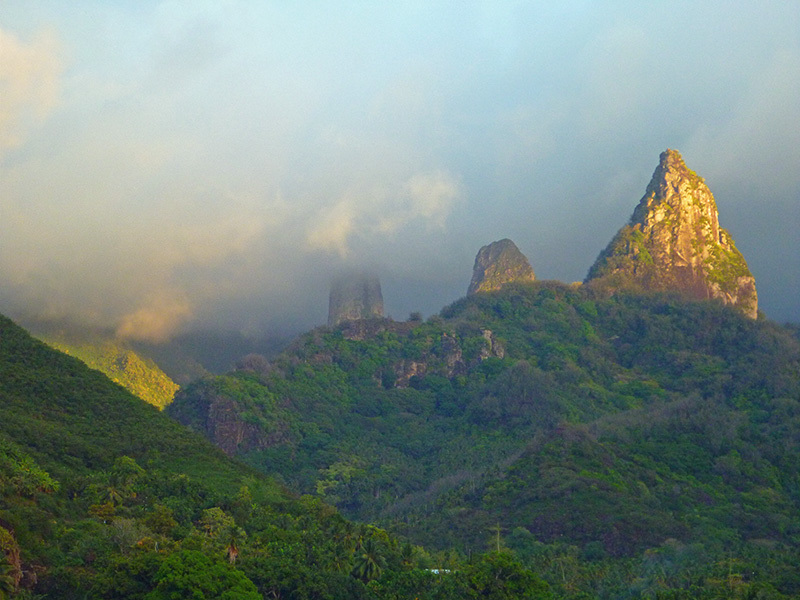 We also caught our first views of Ua Pou’s dramatic skyline of jagged volcanic plugs, the remnant cores of former volcanoes. 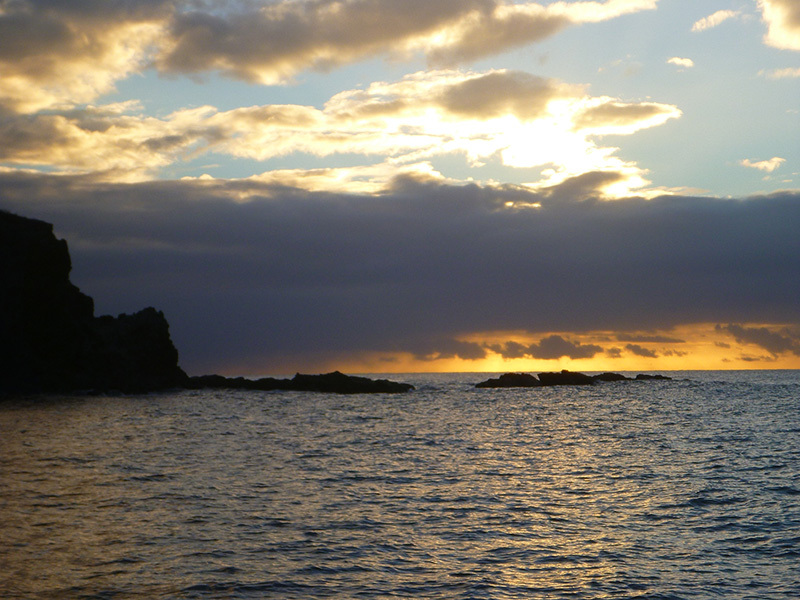 Hakahetau was a scenic anchorage with a small, picturesque village on shore which we didn’t explore. We enjoyed the evening views from the boat. 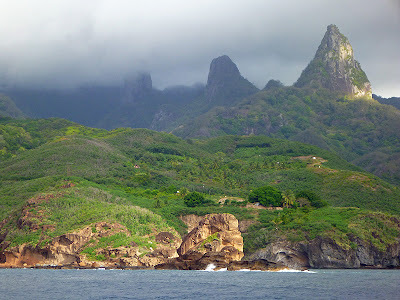 The next morning, we pulled up the anchor and headed around the corner to the main village of Hakahau. While at Hakahau, we saw some of the cultural sites in the village but did not stray far afield. Nevertheless, some special things happened while we were there. While we were admiring the wood carvings outside of a newer building in Hakahau, a woman entering the building invited us to see the inside. The building turned out to be our equivalent of a City Hall, and the woman, an official of the City Council. Inside the building were even more works of art. 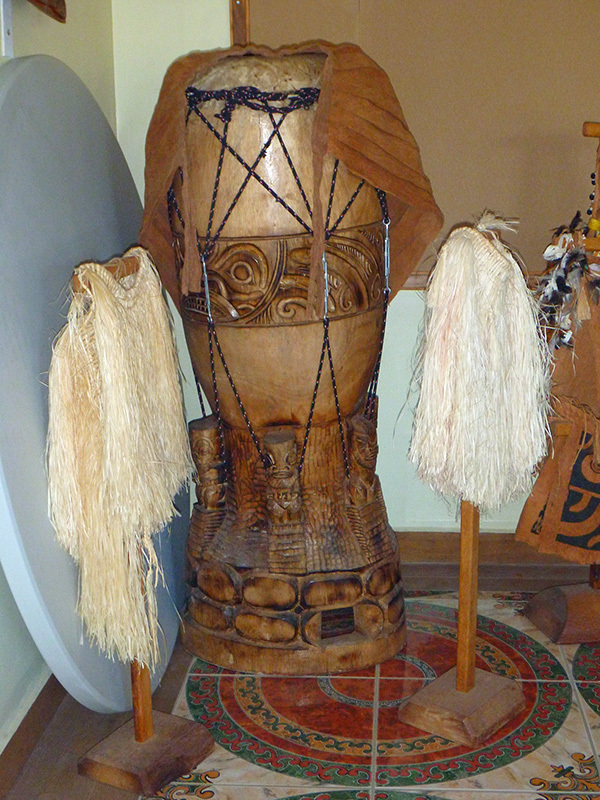 The wall above the central stairwell was lined with tapa cloth and there were beautiful wood carvings at its base. 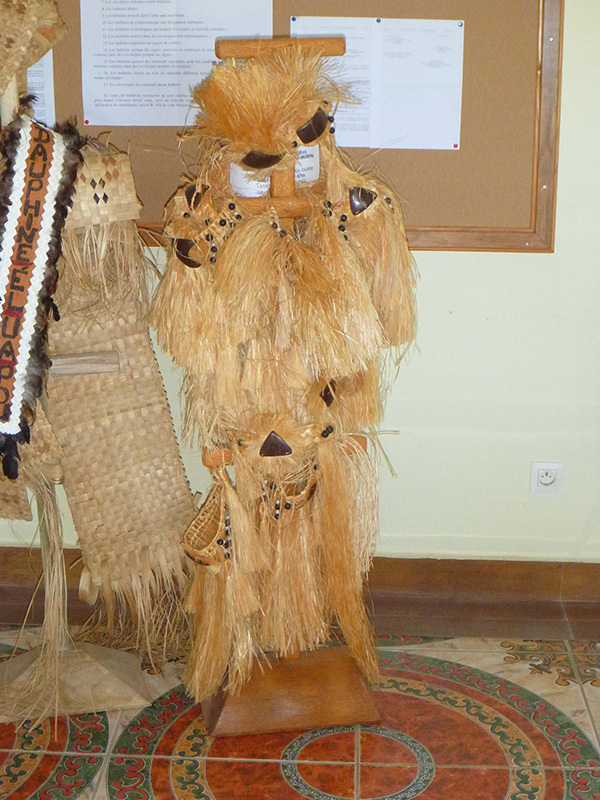 The women led us into the room where the City Council met, and it held beautiful examples of the work of Marquesan artisans. We saw some traditional dance costumes made of tapa cloth and one of the beaters used to make tapa. In one corner of the room stood a splendid hand-carved Marquesan drum. While most of the dancers in the performances we witnessed on Nuku Hiva and Ua Pou now wore “grass” costumes made out of green, plastic strips, the MC at the dance performance on Ua Pou wore a costume very similar to the one shown above. We also visited Hakahau’s church, another glorious example of a Marquesan church built out of stone and wood. 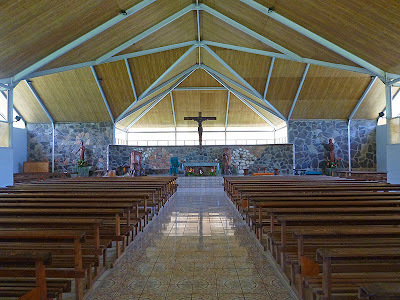 While I am not necessarily in agreement with missionaries converting the local belief systems of Marquesans and other peoples, I had to admit that the churches in the Marquesas were nothing short of magnificient. I loved how all the windows in the churches, such as the ones shown above, open directly to the outdoors and have no panes or screens over them. I wondered if the bow pulpit was meant to represent Noah’s Ark and reflected upon the inclusivity of that image. It’s too bad more of Christianity isn’t modeled on the Noah’s Ark image, in which all of the animals were welcome aboard, instead of being the basis for so many “holy” wars over the years. 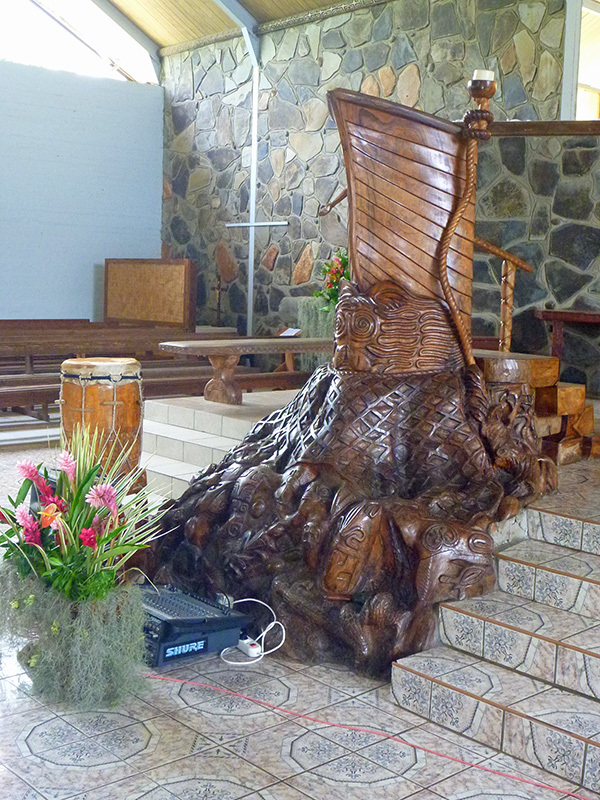 Although the missionaries and priests converted Marquesans to Christianity, some traditional elements remain in Marquesan churches. 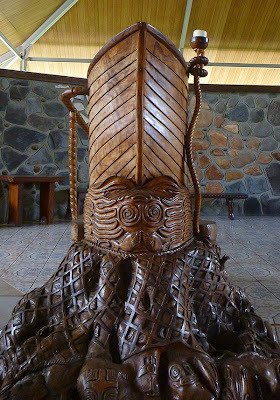 Every Marquesan church we saw had a drum, for example. I found this carving of Jesus on the cross fascinating. 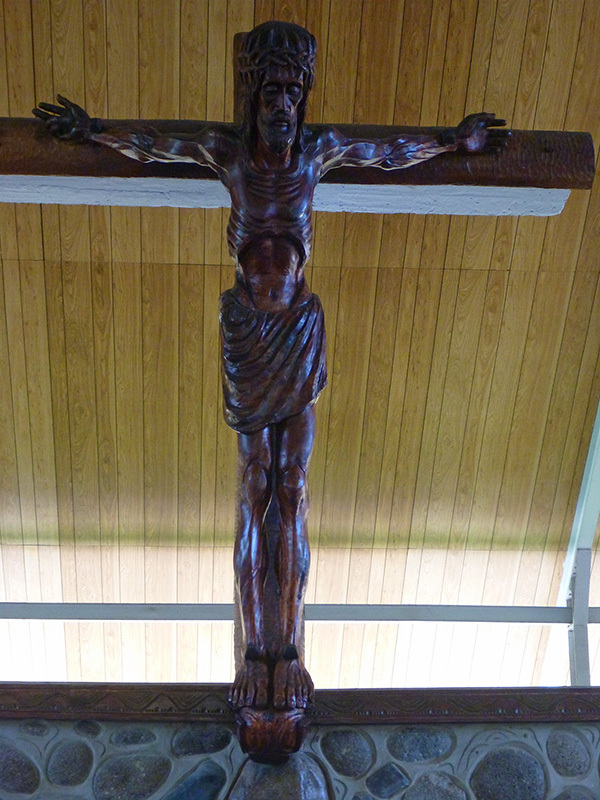 The figure of Jesus looks emaciated, with the exception of his arms. This Jesus had beefy (relative to the rest of his body) muscular arms with exquisitely carved veins. We met Xavier, a Frenchman and retired English teacher who lives on the island. He swims in the harbor almost daily and stops to visit with the cruising boats. We had a mini-adventure when I invited Xavier aboard for a beer and unobserved by any of us, his ten year-old blue boogie board (used as a paddleboard, in this case) blew overboard from where we had stashed it. Even though the old boogie board was moldy, Xavier had said he liked it because it was soft and comfortable, like a favorite pair of jeans. We couldn't let someone lose their favorite pair of jeans! Luckily, I was able to spot the paddle board from the bow (on its way out of the harbor but not yet at the entrance). Patrick sprang into the dinghy to retrieve the board (rowing against the wind since we hadn’t put the outboard on,) while I kept lookout from the bow. All’s well that ends well, and Xavier was able to paddle home with his faithful companion. 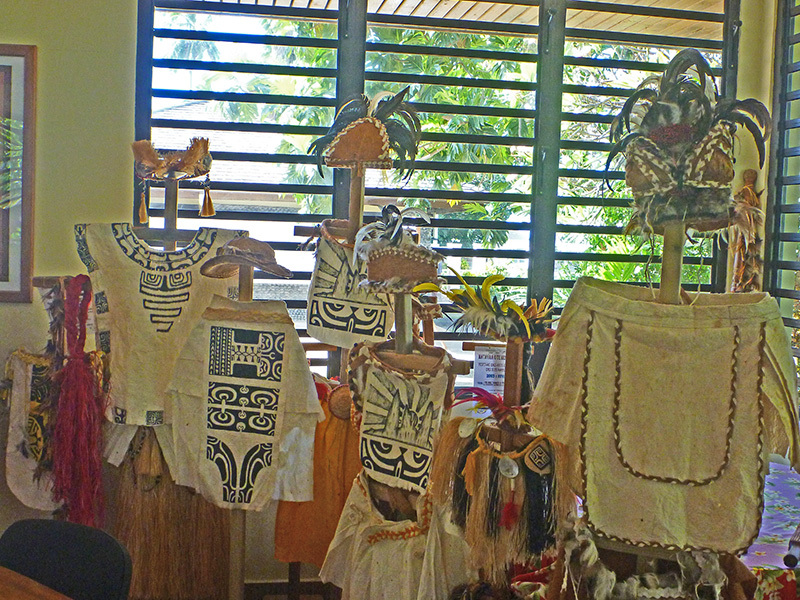 Finally, we went to see another fantastic drumming, dancing, and singing performance on Ua Pou. We were there on Friday night, a festival day, so we made our way to the big open air tent near the stadium. Small restaurants and eateries, chock-full of local patrons, surrounded the tent, and kids and dogs ran all over the place in packs. It was a special performance, because a judging panel was viewing the haka dancers that night for the regional competition. The show went on much longer than the ones we saw on Nuku Hiva. The average age of the performers was also younger, and it appeared that most of the village’s teens and young adults were involved in the performance in some way. The Master of Ceremonies was older than the dancers, and kept up a humorous patter with the judges and the audience while shouting directions to and egging on the drummers and dancers. 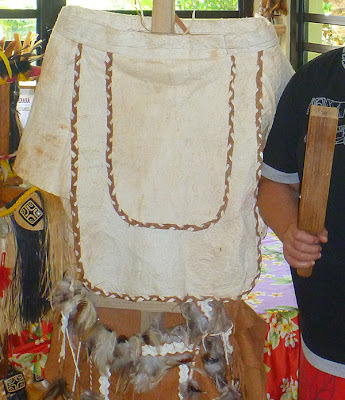 It was on Ua Pou that I saw the most Western influence---in both dress and behavior---on kids and teens in the Marquesas. 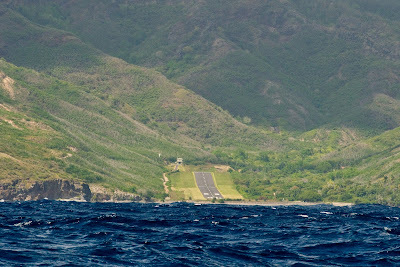 In that way, it was sort of a surreal “last stop.” I don’t know what the difference was: Perhaps Ua Pou has more access to television and internet than some of the other islands we visited. 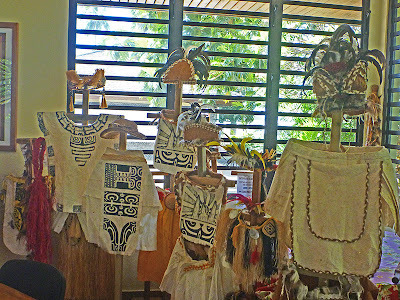 The kids were definitely dressed in Westernized attire and hairstyles, and this was the first place in the Marquesas where we observed a lack of respectful behavior among some of the youth. Our last night on Ua Pou was spent sitting in the cockpit, listening to American tunes blaring from truck stereos on the beach!